Estimating feed supply is an important part of determining stocking rate in a paddock or for a particular land system. Animal production depends on quantity and quality of forage available. During periods of active growth, green grasses and forbs that have a high digestibility provide energy and protein to sustain higher levels of animal production. As these plants mature and become more fibrous, digestibility decreases and the amount of metabolisable energy and protein decreases, resulting in lower levels of production. Therefore the amount of forage required to meet requirements increases as quality decreases. Poor quality feed may not be adequate to maintain some classes of sheep. •	Are there any opportunities to alter your program to better align supply and demand? This procedure outlines processes and issues that relate to measuring available feed for your animals, feed quality issues, seasonal considerations and how to use this information to manage supply and demand. Manage grazing pressure and monitor feed supply. The amount of forage available determines what stocking rates you are able to run and for how long this feed will last. Seasonal conditions will govern what regrowth occurs, and this also impacts on the stocking rate and grazing period. In order to make basic decisions regarding your grazing operation, it is essential that you have a solid understanding of how long current forage will last. Estimates are made by calculating the amount of dry matter per hectare. This can be done using photo standards, or by measuring forage directly. Photo standards are available for all pastoral areas. Once you know the standing dry matter, or available dry matter, you can then utilise the standard intake requirements that are well known for sheep. These are outlined on the following page in Calculate Total Grazing Pressure. Ensure efficient nutrient cycling (good soil cover means more soil water and nutrients available for pasture growth. Total Grazing Pressure (TGP) is the total demand for forage by both domestic and non-domestic animals relative to forage supply. TGP is determined by calculating the total grazing pressure exerted by domestic and other grazing animals. This provides the most realistic indicator of the number of grazing animals and the grazing pressure being exerted on a paddock. The grazing pressure is specified using the standard measure of a Dry Sheep Equivalent (DSE). The grazing pressure from these animals can be significant and needs to be included when assessing the total grazing pressure of stock in the paddock. Determining a realistic estimate for the non-domestic animals can be difficult as some of the species listed are quite transient and will move within and between properties, depending on levels of feed, water and disturbance. Approaches to determining pressure from non-domestics are described in this section. Grazing management is difficult when there is a proportion of the grazing pressure that is unmanaged, as producers often have limited control over non-domestic herbivores. Hence, it can be an important step in grazing management for you to quantify and make an assessment of the issue on your property. One DSE is based on the energy required by a 50kg wether (i.e. a dry sheep) to maintain condition and body weight. Animals that have a higher feed requirement than 1 DSE (a lactating ewe) will have a higher DSE rating. To estimate a DSE figure for stock, an estimate of liveweight and the class of stock is required. Standard DSE tables assist in determining the relevant DSE value for each class of grazing stock. There are DSE ratings for non-domestic animals. These can be found later in this procedure in Manage grazing pressure and monitor feed supply and in tool 12.15. Use the tables in tool 12.14 to calculate the DSE ratings for the different classes of livestock on your property. Bear in mind that your DSE’s will vary according to class of animal throughout the year. A breeding ewe will have varying DSE rating over the year, according to her reproductive status. In order to meet productivity targets in your livestock enterprise, it is important to know when your feed supply and feed demand are at their highest, and identify any shortfalls that may exist. Pastoral properties are often governed by access to markets, and other significant factors as well as seasonal feed availability in determining when key livestock operations are carried out, and therefore demand and supply may not match up perfectly. Nevertheless, it is essential that you undertake a fodder budgeting activity to increase your awareness to key periods of peak demand, and endeavour to align these with peak supply where possible. Production requirements (maintenance or finishing). The annual production cycle, or ‘program’, is very much unique to individual properties and is usually based around seasonal conditions and feed supply, markets and accessibility to the property. These factors are innately considered as they are logical factors in determining the timing of key operations and events on the property. Ideally programs align key finishing times, selling times or lambing times with highest levels of available feed. This ensures optimum productive outputs from the resources available at the time. An important part of this process is to understand the feed requirements at these key times by all classes of stock on your property. By recording rainfall and stocking rate over time, you will build up a profile of how your property’s stocking rate is tracking according to rain received, and this will enable you to make informed decisions regarding stocking rates and formulate strategies to manage tight periods. This activity may be of limited use in areas with aseasonal rainfall patterns (where there is no seasonality to rainfall patterns, such as a wet season). A mixture of species is indicative of a stable and productive grazing system and will give sheep access to a reasonably balanced diet. 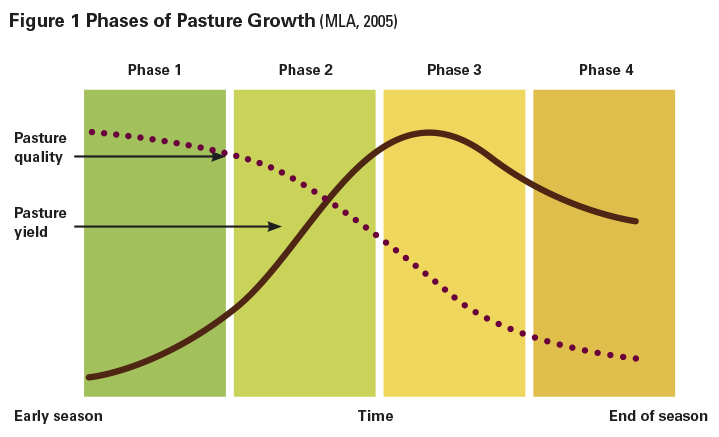 Pasture plants follow a similar pattern of growth, which determines quality and quantity of herbage mass at a given time. Figure 1 illustrates the changes in feed quality and quantity from the beginning to the end of the growing season. Performance of grazing stock is impacted significantly by both quality and quantity of feed on offer. Another way to consider the quality and quantity issue regarding feed availability is to consider their relative stability and quality. An exception to the quality and quantity table above is where shrubs and browse species are concerned. Despite being lower in quality, generally their quality and quantity is less variable over time. These species are of high value because of their stability in the grazing environment. Ephemerals and browse are at opposite ends of the spectrum. In variable arid and semi‑arid environment both attributes are desirable. Perennial and annuals are not inferior or superior to one another, but have complementary qualities. Bluebush (Maireana spp. )/Saltbushes (Atriples spp. )/Tree Browse. The information presented on quality and dietary preferences is general and site specific information should be sought on quality and characteristics of specific species in your pasture. The composition of livestock diets will change considerably between paddocks and seasons. Energy is the main limiting factor to animal performance, and survival. The amount of energy contained in feed varies throughout its life cycle, and can support different levels of production. The amount of energy derived from a feed is related to the digestibility of the feed. Digestibility is the percentage of the feed that is converted to energy. The higher the digestibility, the higher the energy in the feed. The lower the digestibility, the lower the amount of energy in a feed, and more is passed through the animal and removed as waste products. Think of the feed requirements similarly to a vehicle and what is needed to run the vehicle. To drive around, you need fuel. You cannot get very far either, without oil for the engine. In using this analogy, prioritise animal requirements starting with energy. Energy in feed is assessed as megajoules of metabolisable energy per kilogram of dry matter. When addressing nutritional requirements, energy requirements should be addressed first. If pastures are deficient in digestible energy this will be the most limiting nutrient. Not meeting key marketing opportunities due to not being finished, or sale ready. Quite often, what is growing between the shrubs and trees is providing the required energy for grazing stock. As a rule of thumb, a 50kg wether will need to eat approximately 1kg of dry matter per day with an energy level of 8MJ/kg and a protein level of 8% for maintenance. Tool 11.1 provides a summary of the requirements for other classes of livestock. To calculate the feed requirements of livestock grazing, the digestibility, metabolisable energy, and protein content of the feed needs to be determined, as this will impact on the amount of feed that can be eaten and utilised by livestock. This information can be obtained by sending feed material to a feed testing service to undertake a test to calculate the levels of dry matter, energy, protein, digestibility and minerals. You can also consult your local advisor who will be able to provide you with any local data on feed quality. This local knowledge will be a useful guide in the absence of actual feed test results. It should also be noted that stock will selectively graze plants and hence may accumulate higher levels of protein or energy than an ‘average’ feed test result will indicate. the colour of dead material. The figure below illustrates the relationship between feed quality, (digestibility and energy) and the capacity of pasture to sustain various production levels in grazing stock as the plants mature. It shows that as a plant matures, the digestibility and metabolisable energy decrease. Protein is an essential component of the diet of sheep. Just like energy, the level of protein in different species will also vary through the growing season. Many of the pastoral grazing species have high levels of protein. As is the case for energy, the level of protein in grazed plants will vary due to growth stage, rainfall, season and the area in which they are growing. Green plants generally contain sufficient protein for ruminants. When pastures dry out, protein decreases to sub-optimal levels for maintenance of sheep. Animals selecting leaf over stem will also achieve higher performance than a ‘whole plant’ feed test will indicate. 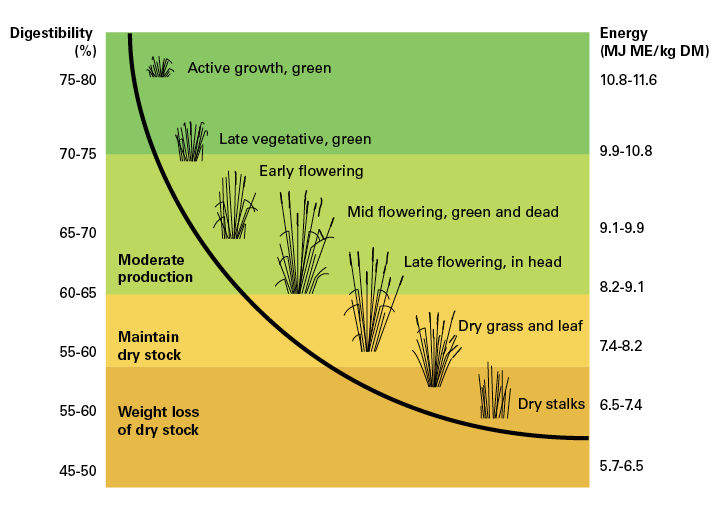 When interpreting feed test results, you need to consider the growth stage, and plant growth habit in context with what part of the plants the animals are utilising. Perennial grasses are extremely important in grazing systems and are a key focus for grazing management and landscape function; they assist in reducing wind and water erosion, provide litter for recruitment of new seedlings and are often the most responsive species to rainfall. Native perennial grasses can be divided into warm and cool season grasses. Warm season grasses do most of their growing and seeding in the summer and are better adapted to high temperatures and light intensities. They are susceptible to frost and can be winter dormant. Cool season grasses grow and seed in the cooler months (winter/spring). They are frost tolerant, provide green feed during winter when temperatures are low and moisture is not limiting. In summer they have reduced growth and survive high temperatures and low rainfall by entering a drought-induced dormancy. Cool season species tend to generate less bulk than warm season species. However, feed quality of cool season grasses is often higher than warm season grasses. The different types of perennials are responsive to rain at different times of the year. A pasture with both warm and cool season perennials will be rain ready throughout a greater part of the year, than a pasture which is characterised by one type of perennial grass, which will be responsive at the time that best suits the single type of grass, e.g. winter. *	In drier regions and seasons this species can perform more as an annual. Another important nutritional factor regarding the nutritional value of grazing plants is the level of minerals and trace elements that the plants present contain. Even though old man saltbush has good levels of energy and crude protein, stock may not perform as well as expected due to the mineral and trace element imbalance. For example, the high salt level will require energy to be expended to excrete this through the kidneys. This issue can be further exacerbated when sheep are drinking water with a moderate or high salt content. Other saltbush species may lead to similar outcomes. In a situation where lower production has been observed, consider the potential for mineral imbalances, and possible courses of remediation/supplementation, to avoid significant production losses. When stock are grazing species known to be of lower quality, e.g. speargrass, it is important that other species with higher levels of protein and energy are available to ensure high levels of production. It is widely known that when dry feed is available, only relatively small levels of green leaf are required to have significant impacts on the weight gain and wool growth of sheep. This is associated with the higher levels of metabolisable energy and protein present in the green material. In the rangelands, this is often achievable, if the plant community contains a mixture of annuals, perennials, grasses and shrubs. The ENRICH project: Perennial forage shrubs providing profitable and sustainable grazing. It has been observed that the underlying driver of successful grazing management is the ability to manage stocking rates (grazing pressure) to match carrying capacity, regardless of the system that management is framed within. Also, stocking rate management (i.e. grazing pressure management) and not grazing system, is the major driver of pasture and animal productivity and natural resource health. Grazing variability: how evenly feed is consumed across all parts of the paddock. Of course this is all dependent on when the rain falls, which species are present, the growth habit and pattern of the favourable species. Utilisation rate is the proportion of pasture available which is grazed by the animals present. Managing utilisation rate is an important part of grazing land management, particularly so in pastoral areas where vegetation communities are diverse, yet fragile, if not managed well. Utilisation rate has a direct impact on both land condition and diet quality. Hence, good grazing management should focus on improving land condition, improving the evenness of use and improving diet quality of the animals grazing. A rule of thumb regarding safe utilisation rate for perennials in the pastoral areas is 20 to 30%. The remaining 70 to 80% will allow recovery post-grazing and ensure that the community of plants remains adequately resourced through root reserves, and biomass remaining to recover after grazing, and especially in the event of a dry season. There are photo standards for utilisation rates of perennial grass species in the Glovebox Guide to Tactical Grazing Management. A method of recording, such as a paddock management book or an electronic recording system (PC, tablet or smart phone) can be used to record dates and numbers of animals recorded in different paddocks. There are a number of smart phone apps available that are designed to assist in the recording process from the paddock. These can be readily found by searching the App Store or Google Play. If total grazing pressure is not well managed, domestic stock will be competing for feed with a large, unmanaged feral or native grazing herd. This will have a significant effect on pastoral production. This becomes even more important in seasons when feed becomes limiting due to lower than ideal seasonal rainfall.